Did you honestly think that the Metal Gear franchise was going to hinge on Metal Gear Rising: Revengeance, a game where a cyborg in high heels cuts watermelon? Of course not. Luckily, we can all stop holding our breath for news of a Snakey adventure because during the Metal Gear 25th Anniversary eventshowcaseextravaganza, 20 minutes of footage was shown for a new title: Metal Gear Solid: Ground Zeroes. Unfortunately, this magical footage is not available on the internets just yet, but this write-up from Gamespot details the goings on. After [some rainy cutscene with a dude with a burned face], out comes a spy climbing from a cliffside near the base followed by the subtitles “From FOX, two phantoms were born”. 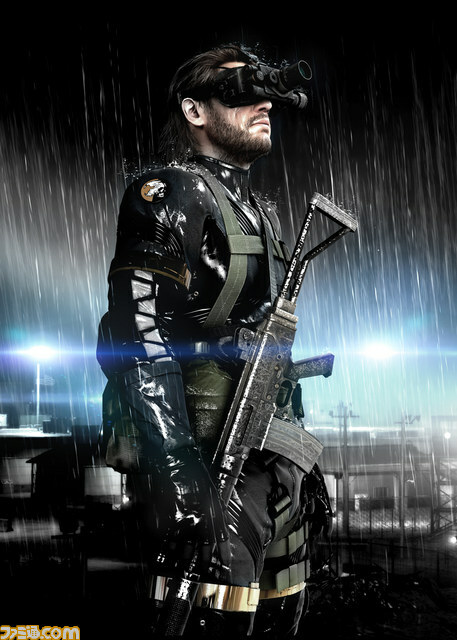 As he flips up his visors, we saw the trademark eyepatch and gruff face with the facial hair: Solid Snake seems to be back at a glance. He’s referred to as Snake; no, not Solid Snake, Old Snake or Naked Snake, just Snake at the moment, so there’s a chance that he could be some clone or someone posing as Solid Snake. Whatever the case, he definitely looks much younger than Old Snake in Metal Gear Solid 4. Old-school fans yearning for the days of a nimbler stealth action hero can sigh with relief at this revelation. Kojima apparently came out to do some real time playing and shooting. The normal Snakey moves will make a return, but it seems as though Octocamo is gone (at least it was in this demo). Although not confirmed as a sandbox game, the area they were playing in reportedly seemed huge, and Snake could drive jeeps or summon a helicopter to pick him up. The demo was played on a PC for maximum sexiness, but the new Fox Engine this demo ran on apparently was written for current consoles, but it is probably safe to assume that the game will launch on next gen systems. My hope is that this new Snake actually is just Sam Fischer, and we get one of the greatest franchise crossovers in history. Who is with me?